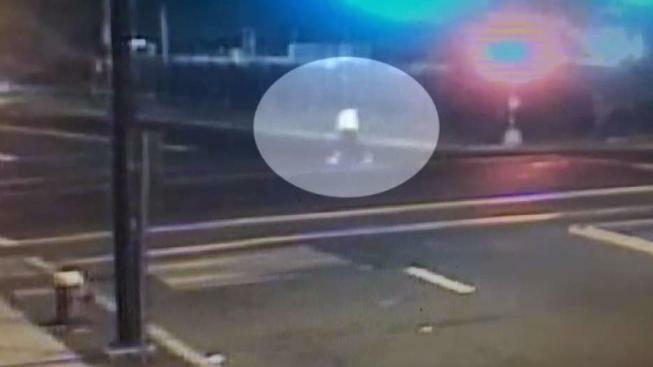 Police continue to search for a hit-and-run driver who killed a woman in Hartford. Surveillance video shows the terrible accident that killed a 58-year-old woman in Hartford earlier in September. The victim was identified as Cynthia James and the cause of her accidental death was blunt injuries to the head, according to the medical examiner. NBC Connecticut Troubleshooters obtained exclusive video of the deadly hit-and-run that happened on Sept. 16 around 2 a.m.
Less than one minute after a Hartford police cruiser crosses the intersection of Park and Hudson streets, the woman is struck by the car. The video shows the victim walking up Park Street where she enters the crosswalk. Initially, she narrowly misses getting hit by a car heading southbound. But as she continues crossing the street, a black car going northbound slams into her, sending her flying toward the edge of the sidewalk. While a crowd of witnesses are seen hovering around her to check on the victim, the black car keeps going. The group of people can then be seen flagging down a Hartford police officer for help. Nearly 14 days after the incident, the driver has not been found. Police said they do know who the suspect is. A non-police source told NBC Connecticut Troubleshooters that the driver is a relative of a Hartford police officer. Hartford police said the investigation is ongoing.